A farm overrun with enormous abstract sculpture. Galleries showing some of the Asia Pacific’s most exciting and irreverent new work. The weather isn’t always great to the east, but the art is. New Zealand’s art scene is vibrant, moving, astute, and gnaws at your consciousness, with a strong connection to history and place. And it’s everywhere, from Auckland’s dozens of little commercial spaces to major galleries in little towns. Last year, Broadsheet spent a week crisscrossing the country’s north island, in search of its best art stomping grounds. Ahead of the Auckland Art Fair 2019, which opens in May, it's worth taking a look back at New Zealand's thriving art scene. At first glance, Auckland is a tangle of highways under grey skies, threatening sudden, violent surges of rain. 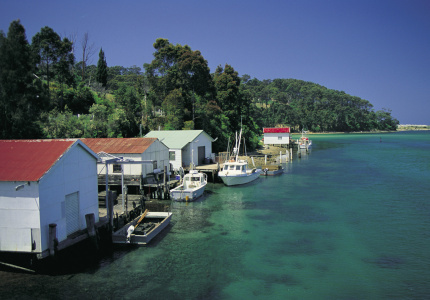 But it’s on a pretty harbour, with backstreets full of little shops and some beautiful green space. Aside from the weather, May is a good time to visit. On the harbour, the annual Auckland Art Fair sees the country’s best galleries crammed into one space. Across 45 booths, there are hundreds of works by New Zealand artists from galleries across the country. There are representatives from Australia and Asia here too, but it’s the local galleries that I kept coming back to. Art fairs are a strange business, marrying the sometimes strange bedfellows of art and suits. At many fairs, gallerists can focus on mid-career, middle-of-the-road art geared towards quick sales. The Auckland Art Fair gets around that by commissioning young, often unrepresented artists to create work for the event. These pieces give it a lift. It also sets up a trip through the island’s art scene perfectly. It’s youthful, irreverent and culturally diverse. Christina Pataialii’s work, for example, was a five-metre wide mural of vivid colour and precise line, painted over three days, and based on travels through the United States. It was an ephemeral piece painted onto one of the site’s walls, and lasting as long as the fair. Angela Tiatia's film of contemporary social disorder, inspired by research into the 1942 Battle of Singapore, shows a crowd smashing up a supermarket in slow motion; some wear combat fatigues; some stand and calmly burn their own self portraits. Anonymous artist PĀNiA! used found objects, sticky tape, and brown-painted garden gnomes to create a very personal space tucked away inside a little shed. Unmissable. The dual-language name is the first hint that New Zealand’s art institutions, including this gallery have a great deal of respect for the country’s initial inhabitants. This extends from the gallery’s architecture – a colonial era building augmented with Māori design elements – to the work on show, from the beautiful 19th century Māori portrait series by Gottfried Lindauer to regular engagement with contemporary Māori art in the rotating exhibitions. Despite savage budget cuts the gallery begs and borrows, and puts on extraordinary shows. Karangahape Road (K Road to the locals) is a go-to area for smaller art spaces. The former red light district turned cultural centre is full of galleries hidden on backstreets, upstairs or in semi-industrial areas. 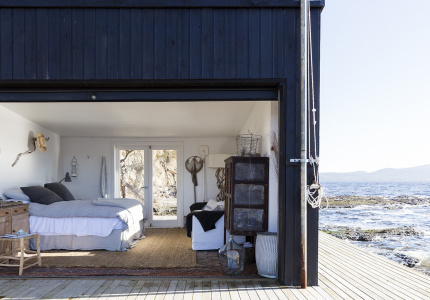 Mokopopaki is a tiny, two-room space with walls of dark brown and dull grey. The walls are a reflection of Mokopopaki’s focus on brownness over whiteness, openness and collaboration over commerce. Around the corner and upstairs is Ivan Anthony, representing exciting young and offbeat artists such as Jess Johnson and Kushana Bush, who both create otherworldly throwback landscapes, vibrant and obscure. Right next door is Michael Lett, where the abstract paintings of Auckland artist Imogen Taylor are juxtaposed with those by Australian Diena Georgetti. Also in the area are Starkwhite and Tim Melville Gallery. You could lose a few days here. 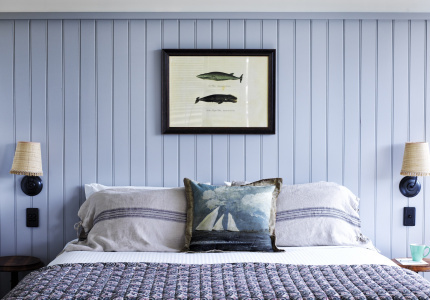 Karangahape Road becomes Great North Road, with sidestreets home to more must-dos, including Hopkinson Mossman, where Peter Robinson’s work – often so minimal it’s barely perceptible – was on show in May. Robinson has a sense of the slapstick, and he seemed to want to induce a state of anxiety in visitors. A marble-sized sculpture sat unheralded in the middle of the floor, waiting to be kicked. A single nail protruded from a wall, with another hanging from it by a magnet. Precarious wire nets divided the room, and several people knocked them to the ground as they brushed past them, then glanced around anxiously as gallery attendants rehung them. Hilarious. 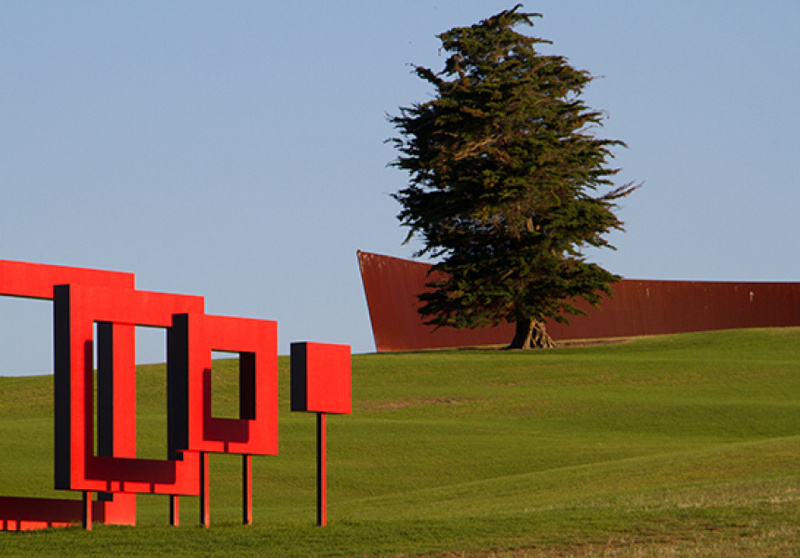 About an hour out of Auckland is Gibbs Farm – a picturesque park overrun by an impressive array of huge abstract sculptures. The farm’s owner is billionaire entrepreneur Alan Gibbs, who since the nineties has made most of his money designing amphibious cars for the military. Amidst rolling hills populated by roaming zebras, giraffes and emus (yes they’re real, and no, do not approach them), vast artworks by some of the world’s greats carve up the land. Anish Kapoor’s Dismemberment, Site 1 is an 85-metre long horn wedged in a valley, and Neil Dawson’s a pop-art-tinged Horizons looks like a scrap of corrugated iron has blown in from the Tasman Sea and settled on a hilltop. Heavily landscaped, it looks a little like the pristine dreamland in which the Teletubbies frolic, though somewhere in this 400-hectare property (according to general folklore and confirmed by farm staff) there’s an entire Wild West town that the billionaire uses for war games with his billionaire mates. It’s only open about once a month, through prior arrangement. One of these open days might – might – align with your travel plans. And if they don’t, make them. It’s worth it. After Auckland I took a 50-seat, rickety airplane to New Plymouth, a town about the size of Ballarat, which is home to the world class Govett-Brewster Art Gallery and the Len Lye Centre, both housed in one remarkable building. The Govett-Brewster has been in New Plymouth since 1970, but the addition of the Len Lye Centre in 2015 kicked it up a notch, making it home to the 18,000-piece collection of one of New Zealand’s most revered, unorthodox and original artists. 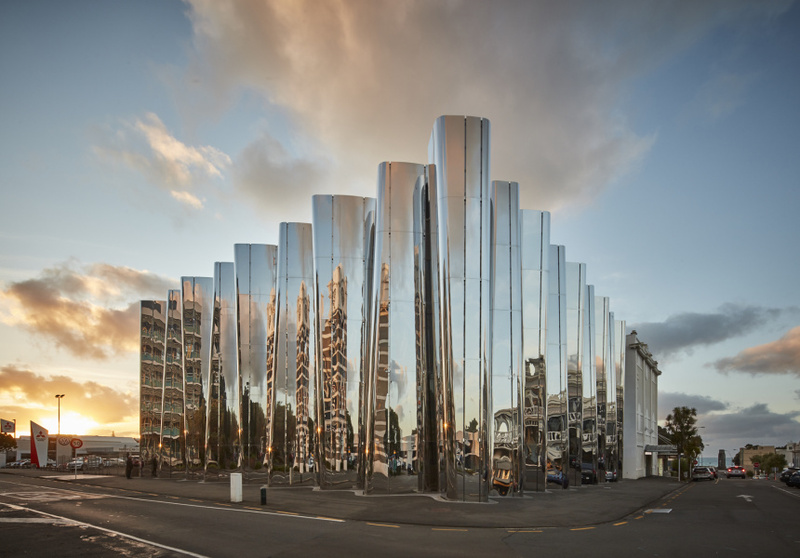 Now the huge, glimmering stainless steel block –with its dramatic curtain-like façade – in the middle of town has a Mona-like presence, attracting local ire and awe in equal measure. It’s an unapologetically provocative building full of provocative art. Len Lye started his career as a pioneering filmmaker, experimenting with colour by painting and drawing directly onto film, producing circuses of light as in his 1935 film A Colour Box. But by 1959, frustrated with the lack of limitations of filmmaking, he became what he described as a “composer of motion”, building kinetic sculptures that got increasingly elaborate. Those pieces are ecstatic, noisy and ingenious. Universe, for example, is a large stainless steel band writhing and twisting against a hanging ball, sending a huge, reverberating clang around the room. Lye died in 1980, but his death hasn’t cramped his art practice; he felt the means to create much of the work he wanted wouldn’t exist until the 21st century, so many of his plans are still being realised. Take Sun, Land and Sea, which currently only exists as a model. Lye envisaged seven huge serpent-like strips of polished steel rearing up and striking at a plinth with bolts of lightning. There are new pieces coming all the time, including upscaled versions of his original works. A prototype for a full-scale Sun, Land and Sea is currently being developed by the engineering department of Canterbury University in Christchurch. The “twenty-five million volt arc of electricity” Lye envisaged might cause some OH&S issues, but that’s for the details people to sort out. Lye was the visionary. Beyond Lye, there’s a program of films – everything from 60s experimental New Zealand cinema to Blade Runner 2049 – and rotating exhibitions of similarly resourceful and inspired work, including the arcane and cryptic work of artist Sriwhana Spong in her exhibition a hook but no fish. And there’s a cafe attached, Monica’s, named for Monica Brewster, women’s rights advocate and arts patron. Best coffee in town. 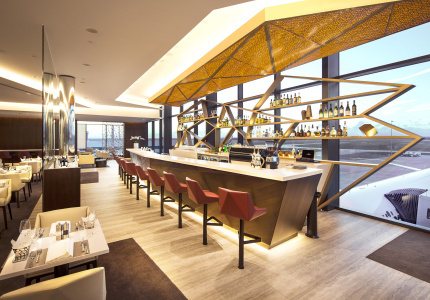 Wedged between jagged hills and a grey harbour, the nation’s capital is a humbler, more down-to-earth place than Auckland, but is also brimming with art. And a sense of humour. The New Zealand national identity seems to be settling into a satirical awareness about its own parochial, self-deprecating sweetness. At Wellington’s City Gallery, the current major exhibition This is New Zealand focuses on ways the nation has been represented abroad. It’s a hodgepodge of New Zealand identity, from 19th century landscapes painted by Europeans to daggy seventies tourism ads. Michael Stevenson’s installation, originally staged at the 2003 Venice Biennale, centres on the Trekka, a hopeless attempt to start a local automotive industry, while Simon Denny’s installation discusses the nation’s very real recent involvement in global spying operations. Down the road from City Gallery is Te Papa. The gallery’s new two-level dedicated art wing Toi Art is packed, and again, it’s inspiringly bicultural. Artists and institutions have a real consideration for their place on Māori land, and in the wider South Pacific region, be they Māori or Pākehā (the Māori term for New Zealander of foreign descent). Sometimes it’s little things, like how all the signage is bilingual, but the those things add up: coming from Australia, they’re reflective of a refreshingly open and considerate cultural attitude. Māori culture isn’t treated as an historical curio, or a political issue. It’s here, it’s alive, and it’s a part of everyday life. And it happens through representative and inclusive art institutions like Te Papa. Inside Toi Art, Marcel Duchamp brushes shoulders with the readymade sculptural jewellery of New Zealand artist Lisa Walker, who appropriates taxidermy ducklings, old mobile phones and a 90s laptop for her (sort of) wearable art. Anything with a string attached to it is a necklace. “It’s okay if my work doesn’t make obvious sense as jewellery,” Walker says. 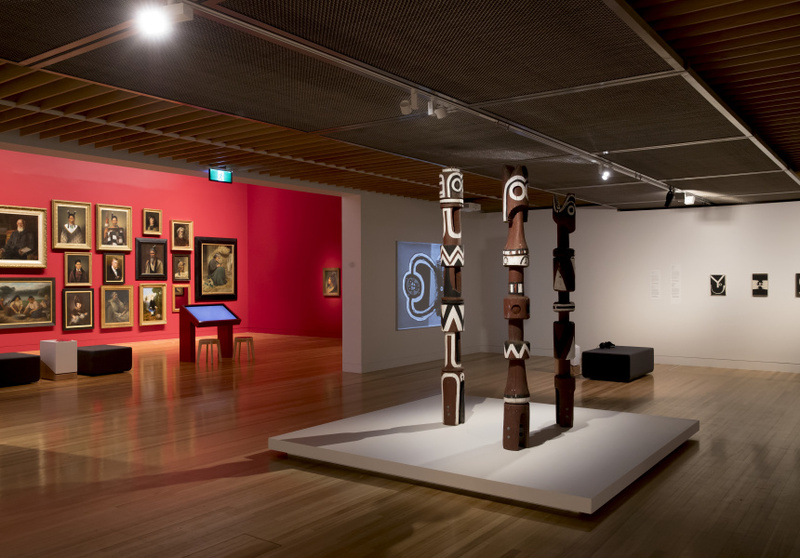 Here you can also see the grand old names in New Zealand art: Colin McCahon’s modernist landscapes, Len Lye’s kinetic, frantic films, and Rita Angus’ portraits, particularly her mesmerising self-portrait Rutu, in which she imagines herself with the dark skin of a Māori woman. Pacific Sisters, a collective of fashion activists, describe themselves as “a Polynesian version of Andy Warhol’s Factory”. A retrospective show demonstrates three decades of their hybrid take on traditional dress, such as grass skirts made from videotape and Levi 501s. Cuba Streeth is dotted with little gallery spaces, all within a ten minute walk of each other. At Robert Heald there are new paintings by Andew McLeod. It’s an ethereal collection of close-up portraits and huge, dreamy tableaus with a neoclassical tinge. Up the road is Enjoy, an artist-run space for often aesthetically challenging, politically aware work by up-and-comers, and upstairs from that you’ll find Peter McLeavey Gallery, which has occupied this building for 50 years, and represents revered New Zealand artists including Colin McCahon and photographer Yvonne Todd. The last gallery on the strip is Suite, a little shopfront with rotating shows downstairs and a very interesting collection upstairs. The second floor is a permanent home to the Westra Museum, a comprehensive collection of the work of documentary photographer Ans Westra, who has caught remarkable fragments of ordinary lives in suburban and rural New Zealand since the sixties. Hopkinson Mossman also has a gallery here in Wellington, tucked away on the top floor of a backstreet off Cuba Street. A steep walk away, or a cable car ride if you’re feeling touristy, is Adam Art, home to Victoria University of Wellington’s art collection. And further out of town, but absolutely worth the visit, is The Dowse Art Museum. At the time I visited it was showing the gentle, intimate video work My Life as a Tunnel by Shannon Te Ao. The flow of Te Ao’s work is interrupted in the middle by a permanent exhibit: a huge, intricately carved pātaka (Maori store house), carved in 1856. This country really does put its first people at the heart of everything. This article was updated on April 17, 2019. Exhibitions may have changed since publication.